When I first googled circumscribed angle, I was led to Khan Academy. I’ve never specifically called an angle a circumscribed angle before, although of course it makes sense that an angle formed by two tangents to a circle from the same point outside of a circle can be called a circumscribed angle. I had always heard it called an angle formed by two tangents. Suppose you are given that the measure of arc ADC is 260˚. What do you know? How were you taught to calculate the measure of angle B? How have you taught students to calculate the measure of angle B? 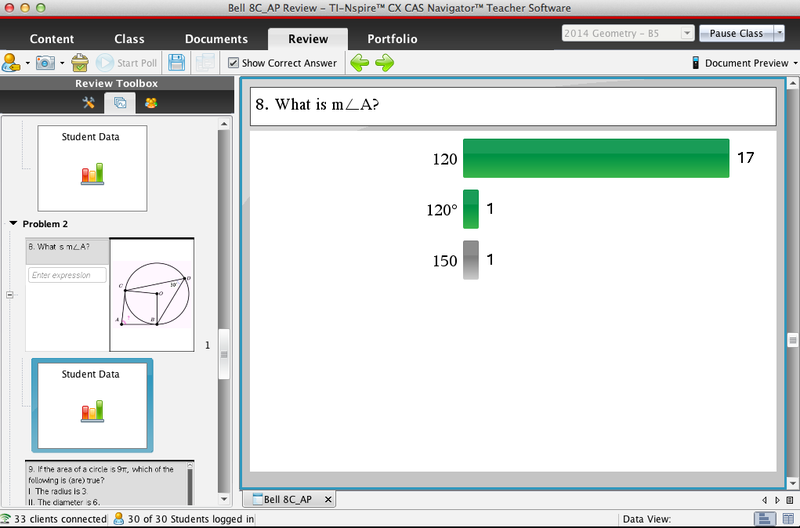 How have your students figured out to calculate the measure of angle B? 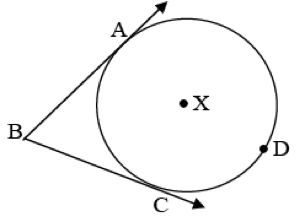 I’ve always thought of this angle as one other in the set of angles with vertices outside of the circle whose measure is half the difference of the outer intercepted arc and the inner intercepted arc. Practicing look for and make use of structure gives my students and me flexibility in what I see and how I can calculate the measure of angle B.
I sent students a Khan Academy question on central, inscribed, and circumscribed angles to see what they could do. The auxiliary lines are drawn because of the central and inscribed angles, but students still practiced look for and make use of structure. Even though most got it correct, we still had a whole class discussion so that students could share how they got the angle measure. Some worked it the way I had been taught. Even those who saw the kite didn’t think through calculating the angle measure exactly the same way. At least one thought of the kite as a quadrilateral inscribed in a circle and said that the opposite angles were supplementary. Yikes! I’m glad that (incorrect) thinking was made visible. 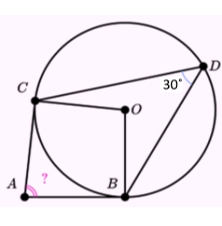 Why are the opposite angles supplementary? This item does give me hope that while I might not “cover” every standard (especially the next year or two), teaching mathematics using the Math Practices is worth our time. Even during an assessment, my students can figure out some of what they need to know by practicing look for and make use of structure and look for and express regularity in repeated reasoning. What #AskDontTell opportunities can you provide your leaners the next time you’re together? So the diagram came from Khan Academy? Oh dear ! The angle at the centre is twice the angle at the circumference (old speak), but it looks as though it is more than 3 times as big. None of your students queried this? This was later in the unit, so they were in “what we know & not what it looks like drawn to scale” mode. Yes – I know it’s awful, but I was also showing that KA is where we started because there isn’t anything else out there. I should look in my textbook to see if “circumscribed angles” are even mentioned; I don’t think they are.